Having a seasoned running mate on the track could do wonders for a rider’s title chase. 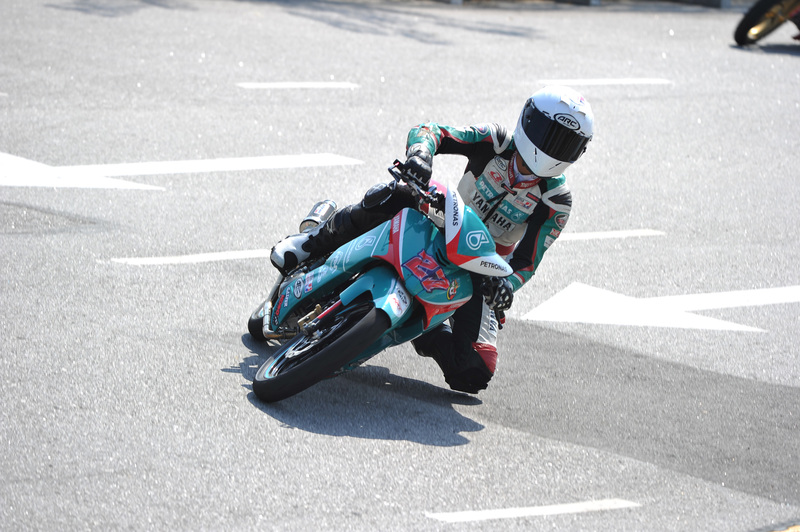 17-year-old Kasma Daniel Kasmayuddin, currently leading the CP130 class of the PETRONAS AAM Malaysian Cub Prix Championship by five points, is feeling secure with senior rider Ahmad Fazli Sham by his side. After a dominating performance at the season opener in MAEPS last month, the CP130 rookie is leading the 2016 title chase with 25 points. Kasma’s PETRONAS Yamaha Maju Motor team mate Fazli Sham is in second place with 20 points. “Fazli is such an experienced rider and I feel like I can rely on him to guard the team’s top position in the CP130 category so far. During the first round, Fazli successfully held back the rest of the field, and I was able to win the race by a large margin. We hope to tag team our way to the podium again for the second leg in Batu Kawan,” said Kasma. The 17-year age gap between Kasma and Fazli has not affected the duo’s chemistry when it comes to working together. “Fazli was the CP130 champion in 2007 and 2008. His racing career has been marked with a lot of success and he has accumulated a wealth of race craft in the process. He has been my mentor since I first joined team Maju as a rookie and he has never been stingy about sharing his knowledge,” said Kasma, who was also the CP115 champion in 2015. “It has been eight years since team Maju has won the CP130 Team Award. I hope that both Fazli and I will be able to spearhead the team’s comeback to the top steps of the podium,” said Kasma. Round 2 of the 2016 PETRONAS AAM Malaysian Cub Prix Championship will take place at the Stadium Batu Kawan on April 16 and 17, 2016. Spectator entry is free.